This archive holds all posts form July 14, 2008. In the last few days, there has been a telling confluence of events related to racism in medicine. In the story that’s getting the most coverage from major news outlets and a few blogs, the American Medical Association (AMA) has issued an apology for more than a century of discriminatory policies toward black physicians, including those that effectively restricted membership in the AMA to whites only. The way the AMA did this in the 1890s was to restrict access so that the only physicians eligible for membership were those doctors who already belonged to a state or local medical society. The state and local medical societies were almost all racially restrictive, meaning only open to white membership. The AMA never took any action to challenge the racist practices of the state and local societies. So, the AMA could say they had a “race blind” policy, when in fact, they were complicit in the same racist exclusionary practices that ended in the same result: African-Americans were not allowed to become members in the AMA. That’s the way they did it. The reason? Decrease competition for patients, and the revenue that patients represent. If you have any doubts about this, read Paul Starr’s compelling The Social Transformation of American Medicine (1982). And, an excellent companion to that book is Harriet Washington’s recent Medical Apartheid (2007). 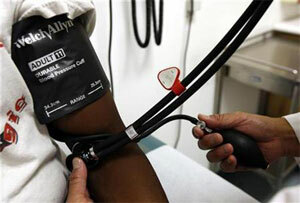 according to Dr. Nelson L. Adams, president of the National Medical Association (NMA). The NMA is an African-American physician group founded in 1895 when black physicians were excluded from the AMA. In his written statement, Dr. Adams goes on to commend the AMA for their “courageous step” and encourages us all to “seize this opportunity to move forward to correct these injustices.” It’s a noble move on Dr. Adams’ part, unfortunately, these injustices are do not exist exclusively in the distant past. UPDATED (5:20pmEST): For example, in New Jersey just two days ago, three EMS workers were fired by the University of Medicine and Dentistry of New Jersey over a racist incident. 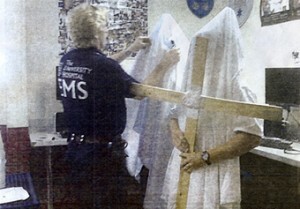 The university’s president said that the three were terminated after cell phone camera images surfaced of paramedic trainees at University Hospital in Newark garbed in white sheets resembling Ku Klux Klan robes (photo from here). On a local news report in the area, they interviewed a person on the street and got their reaction to this, and it reminded me of some of the accounts in Living with Racism (Feagin and Sykes, 1993). The man, who was black (and yes that’s relevant to this story), said something along the lines of: “If this is what they got caught doing, you know that there’s other stuff going on that they didn’t get caught doing!” This is the kind of everyday racism that black people live with in this country (and elsewhere). The harm here is not only in this incident, it’s also in the wondering about “what else” is happening in the back stage of white people’s behavior. And, for their part, white people engage in this sort of behavior and then call black people “paranoid.” What’s interesting too, here, is the language. How is this ‘hazing” – a ritual following which someone is inducted into a group, club or state of being? I don’t think that applies here. The lead-in to the local news report I heard also referred to this incident as “horrifying for the memories it evokes of another time.” It seems to me that such an analysis misses the harm of such acts in the present. Of course, this kind of ongoing racism has serious health consequences for in the present tense; and, indeed, the white EMS workers in this incident are working and making emergency calls in a predominantly black and Latino neighborhood. So much for our putatively “post-racial” society.